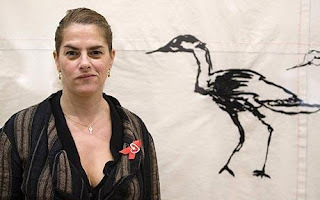 As part of the new Royal Academy show on Climate Change Tracey Emin is displaying embroidered birds and insects (Photo Reuters). Have to admit, I’m personally really pleased that embroidery and more traditional crafts are making their way back into being accepted as modern art rather than viewed as a hobby for older generations. The industry saw a boost in sales of knitting needles and yarn when it was publicised that celebs and film stars were knitting and purling in their down time, I wonder if these latest pieces by Tracey Emin will be the first step in a similar resurrection for needlework?